Queen Esther, through the prayer and fasting of the Jews and her household within the palace, had gained the favor and protection of God. On the third day of the fast, beautiful Esther dressed up! She put on her royal robes, and stood within view of the king. She did not approach him so that she would not break the law of approaching the king without being called. She stood within the king’s view, and let the king see her in her beautiful royal robe, her beautiful form. She assured that when he did see her, he would invite her in. She stood within his view and waited for it to affect his heart. King Ahasuerus sat on his throne, and then he saw Esther, the woman he loved. She had not been called before him for over thirty days, and no doubt he had missed seeing her. He held out his golden scepter to her as an invitation to come to him, and Queen Esther went to the king, and touched the top of the scepter. Esther could have asked for the Jewish people to be saved right then, but something, perhaps the Holy Spirit, perhaps her nerves, perhaps her gentle humility, prevented her from asking. Instead, wise and gentle Esther requested that “If it pleases the king, let the king and Haman come today to the banquet that I have prepared for him.” By inviting Haman, the king’s most favored official, she was showing respect to Haman, and would gain more of the king’s affection. Now what’s a man to do when a beautiful lady invites him to dinner? The king was EXCITED! He says to the officers that were present, “Bring Haman quickly, that he may do as Esther has said.” And he and Haman went to the banquet of wine that she prepared. A banquet of wine was mostly wine and fruits. The king having access to all sorts of meats and foods had no need to be fed, but would most likely enjoy wine and fruits as celebration. King Ahasuerus was still curious as to what had brought Esther to him. Again he asked her “What is your petition? It shall be granted you. What is your request, up to half the kingdom? It shall be done!” Yet, Esther waited. She answered the king softly, saying “My petition and request is this: If I have found favor in the sight of the king, and if it pleases the king to grant my petition and fulfill my request, then let the king and Haman come to the banquet which I will prepare for them, and tomorrow I will do as the king has said.” A second banquet! Once again, wise Esther invited the king - and Haman. She knew that respecting those the king respected would endear her to him even more. Again, Esther waited to tell the king her petition. There are two thoughts on why she waited. First, it could be that God had forbid her to ask at this time knowing the events of the next day should come to pass first to empower her request. Secondly, it could have been part of her plan to further entice the king. Regardless, the king would now be waiting in curiosity for twenty-four hours to find out what his beautiful wife desired. It was like knowing someone has a secret to share, and they say “I’ll tell you later”. You’re on pins and needles until the time comes for them to share the secret! The king would no doubt spend the next day with Esther’s secret at the forefront of his mind. And how would Haman spend the next day? In misery. A prideful man is never content. As Haman leaves the King’s palace, he is walking ten feet off the ground. I can almost hear his prideful heart singing “Queen Esther likes me! Queen Esther likes me! I’m going to dinner! 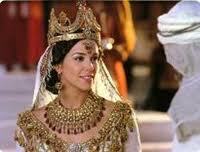 Queen Esther likes me!” And then he walks by the gate where Mordecai is positioned. Mordecai neither moves, stands, bows, nor shows evil Haman any form of respect. Can you hear Haman’s ego bubble popping? Haman’s pride infuriated him! When he gets home he calls together all his friends and his wife Zeresh to throw himself a pity party! He then tells them of all his riches, his multitude of children, how the king had promoted him above the other officials of the king’s government. Oh how proud he was to name all the glory he had given himself! And then he tells them, “Besides, Queen Esther invited NO ONE BUT ME to come in with the king to the banquet that she prepared; and tomorrow I AM AGAIN INVITED by her, along with the king.” Mr. Big Shot was so very proud of himself! He perceived that he was almost royalty within the king’s gates. And then Haman’s heart goes back to self-pity and he says “Yet all this avails me nothing, so long as I see Mordecai the Jew sitting at the king’s gate.” Oh, someone hand the baby a tissue! There is nothing as unattractive as a man filled with pride, and Haman had become full of himself. How silly he was to think that because of his riches and position he had anything at all! God has hidden more gold within the earth that man could every find, and power on this earth is so very temporary! Yet from those two devices, so many of us allow ourselves to be corrupted. Haman ignored God and pursued to kill His favored people, the Jews. Hearing his sadness regarding Mordecai, his wife and friends encouraged his ego by saying he should build gallows “fifty cubits high, and in the morning suggest to the king that Mordecai be hanged on it; then go merrily with the king to the banquet.” Not only would he suggest the king have Mordecai hanged, but he would build the gallows of extreme height so that everyone could see Mordecai’s fate. Oh, Haman loved the idea and went merrily about building the gallows. In Proverbs 6:17-19 we read the seven sins that God hates. They are a complete resume of who Haman had become. The description says “A proud look, a lying tongue, hands that shed innocent blood, a heart that devises wicked plans, feet that are swift in running to evil, a false witness who speaks lies, and one who sows discord among brethren.” Thought Haman thought himself to be rich and full of glory, he was hated by Almighty God. Humility is the only cure for pride, and the only way to defeat it. Pride is the dirt of the heart, and humility is soap and water.